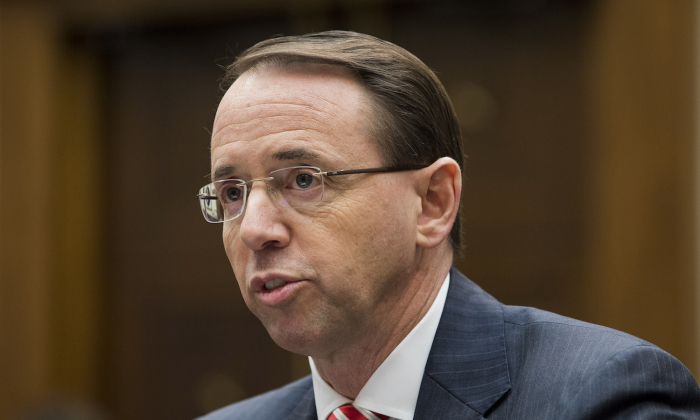 Members of the conservative House Freedom Caucus have drafted articles of impeachment against Deputy Attorney General Rod Rosenstein, but they only intend to launch impeachment as a “last resort,” in case he won’t hand over documents requested by the House Judiciary Committee. On March 22, the committee requested documents related to its investigation of potential abuses of the Foreign Intelligence Surveillance Act (FISA). The act has been used to spy on Carter Page, former campaign adviser of President Donald Trump, and the surveillance warrant was obtained using a “dossier” of unverified opposition research funded by the campaign of Hillary Clinton and the Democratic National Committee. The House investigators have criticized the Justice Department for slow-walking their requests for documents that could shed light on how the previous administration had been using the FISA to spy on American citizens. The articles of impeachment, which serve as a basis for impeachment proceedings, allege Rosenstein “engaged in a pattern of conduct incompatible with the trust and confidence placed in him in that position by refusing to comply with [the March 22] subpoena,” according to Fox News. Earlier in April, Attorney General Jeff Sessions selected U.S. Attorney John Lausch to respond to the document requests. On April 23, Rep. Bob Goodlatte (R-Va.), chairman of the House Judiciary Committee, and Trey Gowdy (R-S.C.), chairman of the House Oversight and Government Reform Committee, announced they met with Lausch and struck a deal regarding the document requests. Since in Page’s case, the warrant was pushed through using unverified opposition research funded by political opponents, House investigators suspect the FISA was abused. The FISA warrant on Page was issued on Oct. 21, 2016, and then renewed three times every three months. At least one renewal was signed by Rosenstein. Other renewals were signed by former FBI Director James Comey, former Deputy FBI Director Andrew McCabe, former Acting Attorney General Sally Yates, and other officials. This point likely refers to McCabe, who oversaw the Clinton investigation, while his wife Jill collected some $700,000 from Clinton associate Gov. Terry McCauliffe’s political entities, based on records obtained by True Pundit. The Russian investigation is led by special counsel Robert Mueller and overseen by Rosenstein. It looks into whether there was Russian government interference into the 2016 election. It also looks into whether Trump “colluded” with any such interference, though that line of reasoning has mainly been based on the unverified “dossier.” Trump calls it a witch hunt. Ohr was demoted at the Justice Department in December, Fox News learned, for concealing his meeting with Fusion GPS, a company that was paid to put together the “dossier.” Ohr’s wife, Nellie, worked on “research and analysis of Mr. Trump” for Fusion GPS during the 2016 election, the company’s founder Glenn Simpson said in a signed declaration filed in U.S. District Court in Washington, D.C., Fox News later reported.